Mom, Dad.... stay off my site. yes really, i don't get it. is the miracle inventing corndogs 2000yr before they actually were invented? why would he be in a kitchen at a time women were domestic slaves? did they even have kitchens in that time or did they just eat raw meat? why does the adult look like the traditional xtian image of jesus? and why does the child look like a redneck retard? why would he have to eat them all? i give up,what did he do, coat them in sugar, fry them in 50lbs of butter and feed them to paula deen? 1. The title of the piece is Jesus' first miracle, so from the title of the cartoon, you can assume that Jesus will be performing a miracle. 2. Upon looking at the comic, it is pretty obvious that Jesus is very young, so this miracle was very early on when he was a child. 3. The woman (by this time we might assume it is his mother Mary) is scolding Jesus for his miracle which seemingly has to to with corn dogs that Jesus now has to eat. 4. The punch line of the joke is not exactly found in Mary's words so instead we need to do some deeper thinking. 5. As we reflect upon some of Jesus' other written miracles, we remember the fishes and the loaves story in which Jesus took a small amount of food and created a large amount of food. 6. 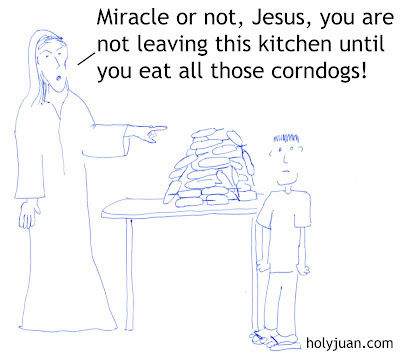 Now the joke is revealed in which Jesus turned one corn dog into many and his mother is pissed, miracle or no. NEXT WEEK: Why did the chicken cross the road.